'Allo 'Allo - Le Christmas Dinner Show may be the upcoming event you’re looking for. 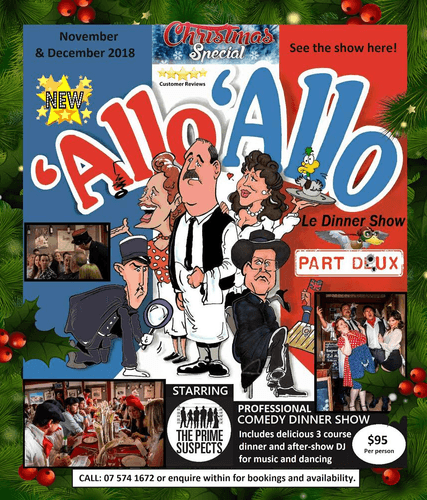 NEW 'Allo 'Allo - Le Christmas Dinner Show: "Part Dux"
Coming to Katikati for one night only! Pop along with "Friends" to Katikati's Central Park Bar & Kitchen Restaurant for a night to remember in an all new show as Rene Artois juggles the Gestapo, his most daring mission yet for the Resistance, his secret affairs and wife, Edith. "A great night of entertainment! Loved it & will come again!" - John B, Mount Maunganui. "Just what The Bay needs - a great interactive show with a fantastic theme." - Bayfair Shopping Centre function. "Great show, very entertaining, lovely meal." - Sharon. D, Tauranga. "Superb, authentic, entertaining." - Prodent Practice staff party. "Very entertaining will recommend to everyone!" - Karen G, Rotorua. "Excellent show, lovely food. Well done!" - United Video staff function. "Awesome show, so funny!" - Sarah S, Christchurch.